The Sierra Grandstand is truly an experience. Since the road is quite rocky in places, high-clearance vehicles are required by people who venture out on this ride. There are some areas where bushes have grown over the road and many places are pretty rough going. In those areas, you may find yourself driving only a few miles per hour so allow yourself four hours or more to complete the trip. This is a 13 mile one-way self-guided road...you can get a flyer at the Mi-wok or Summit Ranger Stations. (I highly recommend the flyer as this gives a detailed route with the numbered signposts giving a description of the seven points of interest.) Just in case one is not available, there is a description given below for your convenience. Since there are numerous places to view the unending ridges and volcanic formations, as well as some rare species of wildflowers, be sure to bring your camera and be prepared with plenty of space on your memory card. You may want to bring a picnic lunch and plenty of water. Remember to carry out your trash! From the Summit Ranger Station, turn left onto Pinecrest Lake Road, turn right at Dodge Ridge Road, then another right just as you reach the one-way road entrance to Dodge Ridge. Turn left at Forest Service Road 4N26. 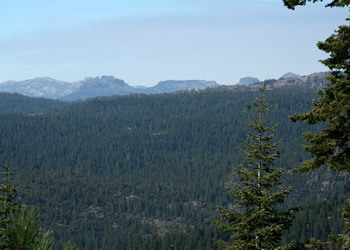 (One could also drive west on Hwy 108 from the Summit Ranger Station to Crabtree Road, which is 4N26, and turn left. Whichever way, continue the following. Just before reaching Aspen Meadow, you will see the large Sierra Grandstand sign on the right. The road begins there at 4N25 to 4N33. Follow the directions of the brochure as you head down the ridge finally ending at 3N01 at the Fahey Cabin. Turn right toward Long Barn and continue to Highway 108.